Finals Week Studying in the Library = Food! of education and to promote the teaching profession. American Democracy Project: take the bus to vote! Buses available April 27 & 28, multiple times. 2016 LSTA Indiana Memory Digitization Grants Awarded along with other projects! The Indiana State Library has selected 13 projects to receive $229,510 in LSTA funding for the 2016-2017 grant year. Using grant funds, public, academic and special libraries will be contributing collections with a uniquely Indiana focus. This year’s projects will feature a number of topics, including Indiana’s automobile and limestone industries, LGBTQ histories, the Harmonists, newspapers, court records, architectural drawings, Hanover College history, and the USS LST Ship Memorial. Three collections will be focused on the histories of African Americans in the state, including South Bend, Bedford, and Indianapolis’s Bethel AME Church. The Indiana State Library will also continue their collaboration with Indiana State University to establish InDiPres, a statewide digital preservation solution for digital collections. Many of the projects will invite Hoosiers to contribute materials during scan-a-thons held throughout the Bicentennial year. All materials digitized through the projects will eventually be available on Indiana Memory, the state’s digital library, and the Digital Public Library of America. For questions about the grants or Indiana Memory, please contact Connie Rendfeld at (317) 232-3694 or crendfeld@library.in.gov. Library Services and Technology Act (LSTA) funding is made possible by The Institute of Museum and Library Services, the primary source of federal support for the nation’s 123,000 libraries and 35,000 museums. The Institute’s mission is to inspire libraries and museums to advance innovation, lifelong learning, and cultural and civic engagement. Their grant making, policy development, and research help libraries and museums deliver valuable services that make it possible for communities and individuals to thrive. To learn more, visit www.imls.gov and follow IMLS on Facebook and Twitter. Discussion groups will have pizza and tackle this interesting question. Colleen Haas, a full-time instructor of African and African American Studies, has been chosen as a Faculty Fellow in the Faculty Center for Teaching Excellence to develop and implement a Multicultural Curriculum Learning Community at Indiana State. The Multicultural Curriculum Learning Community will offer the opportunity for faculty to transform existing courses or develop new course content relative to diversity, inclusiveness and global societal perspectives gained from the sessions provided. An announcement calling for participants will be coming soon. Haas received her bachelor’s degree from The College of St. Catherine in St. Paul, Minnesota in 1983. She earned her master’s (2005) degree and doctorate (2010) in ethnomusicology from Indiana University. Haas spent 12 months researching in Brazil as a Fulbright scholar in 2006. She joined the Indiana State faculty in 2011. Last week, Haas was recognized with the Community-Based Learning and Scholarship Award during Indiana State University’s Faculty Recognition Banquet. Edith Campbell, an assistant reference and instruction librarian at Cunningham Memorial Library, will assist with the initiative. She received a bachelor’s degree from the University of Cincinnati and master’s degree from Indiana University. She will serve the initiative as a faculty affiliate via the Faculty Center for Teaching Excellence. U.S. abortion clinics are fighting to survive. Since 2010, hundreds of laws regulating abortion clinics have been passed by conservative state legislatures, particularly in the south. These restrictions, known as TRAP laws (or Targeted Regulations of Abortion Providers) are spreading across America. Faced with increased costs of compliance and the alarming fear of violence from protesters, the stakes for the women and men on the frontlines couldn’t be any higher. As the battle heads to the U.S. Supreme Court, the documentary Trapped follows the struggles of the clinic workers and lawyers fighting to keep abortion safe and legal for millions of American women, many of them poor and uninsured. The Library and the Multidisciplinary Studies Department is hosting a screening of TRAPPED, a new documentary about new state laws targeting abortion providers. The film features concerned, caring, frustrated staff from centers in Texas, Mississippi, and Alabama. This screening is one of five being shown throughout Indiana during the month of April, to shine a spotlight on the erosion of women’s rights and increasing restrictions to access to health care. A post-film discussion will be led by Linda Maule, Dean of University College and professor of Political Science. 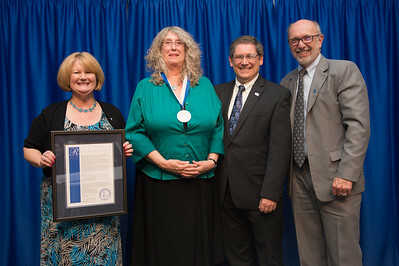 Indiana State University honored seven educators during its annual Faculty Recognition Banquet Thursday.President Dan Bradley presented the President’s Medal — the university’s highest award for faculty — to Cinda May, chair of Special Collections at Indiana State’s Cunningham Memorial Library. May earned her bachelor’s in English from the University of New Orleans. She holds three master’s degrees — in English from the University of Texas at Austin, in information and library science from the University of Michigan and in history from Indiana University. 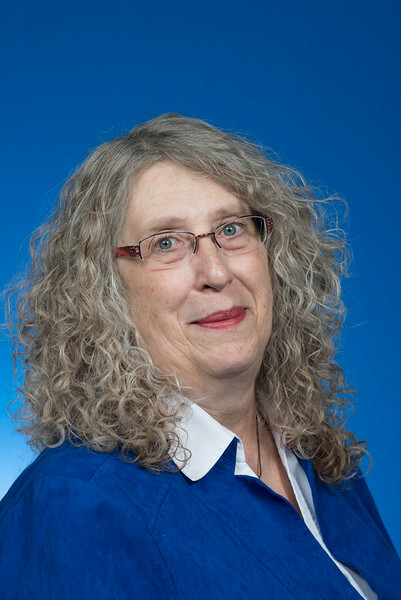 May joined the Indiana State faculty in 2006 as the coordinator of Library Digital Initiatives. She was appointed to her current role in 2010. While she has led and planned numerous initiatives, projects and events, May said serving as project director for Wabash Valley Visions & Voices Digital Memory Project — now in its 12th year — is one of the most rewarding experiences of her career at Indiana State. • Caleb Mills Distinguished Teaching Award: Keri Yousif, professor of French. • Community-Based Learning and Scholarship Award: Colleen Haas, instructor of African and African American Studies. • Theodore Dreiser Distinguished Research and Creativity Award: Kevin Bolinskey, associate professor of psychology, Rusty Gonser, professor of biology, and Kit Kincade, professor of English. • Faculty Distinguished Service Award: Richard Lotspeich, professor of economics.